Successful “Scale-up“ requires expertise, experience, innovative ideas, standard methodologies and commitment to safety, quality and project success. Cymer exemplifies this concept. Cymer, LLC analytical laboratory performs quality control test for existing products and the analysis of new products from Research and Development. 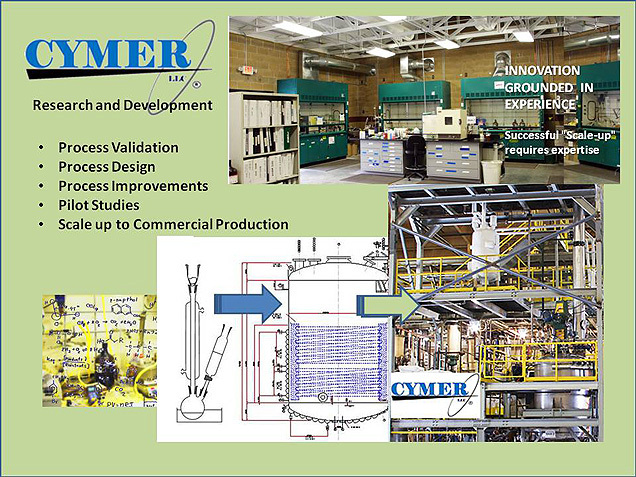 Cymer Research and Development Laboratory is available for contract process development work. Research and Development Lab provides small scale manufacturing for scale-up and pilot programs.